Round two! 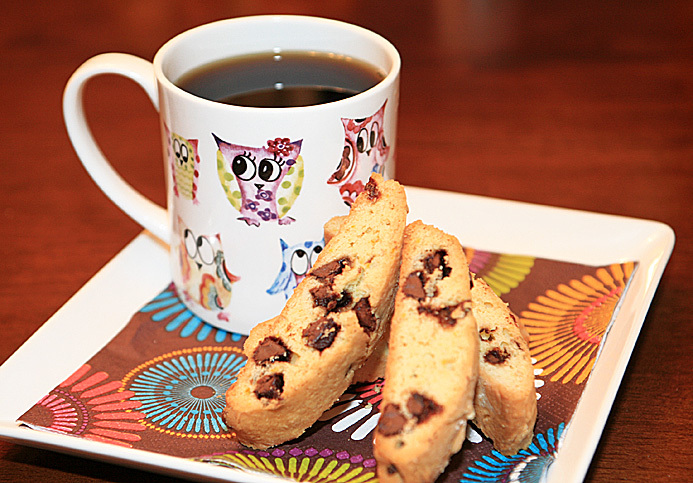 Here’s another amazing biscotti recipe for you. As we mentioned in our Almond Biscotti post, we never knew how easy it was to make these crunchy coffee cookies. At most coffee shops you pay $1.25 – $2 for one cookie. For the same price, you can make a whole batch and eat for a week. Combine the sugar and butter a large prep bowl and cream with a hand mixture until it’s pale and fluffy. Add the eggs, one at a time (making sure to mix well before each addition). Add the orange zest and vanilla and blend on low speed, about 30 seconds. In a separate bowl, combine the flour, baking powder and salt. Add the flour mixture to the batter and beat until combined. Gently fold in chocolate chips. Flatten each log into a 2-inch-wide strip. Bake until lightly golden, about 30 minutes. Transfer the logs to a cooling rack and cool, about 15 minutes. Reduce the oven to 300. Cut each log diagonally into thick slices using a serrated knife. Arrange the slices, cut-side down, on the baking sheet. Bake until crisp, about 20 minutes. Transfer the slices to the cooling racks and let cool.